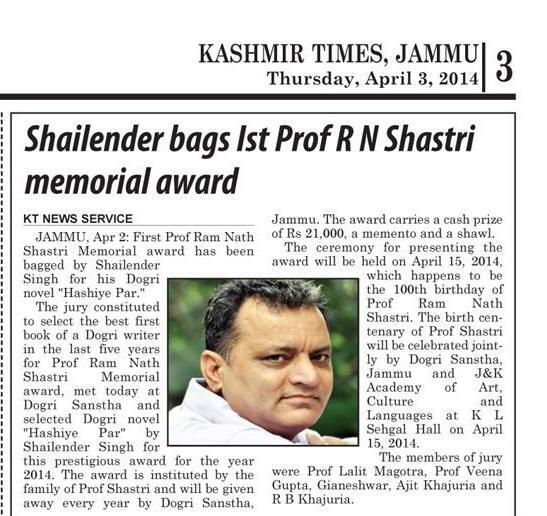 JAMMU, Apr 15: Shailender Singh was today given awaythe first Prof Ram Nath Shastri Memorial Award. 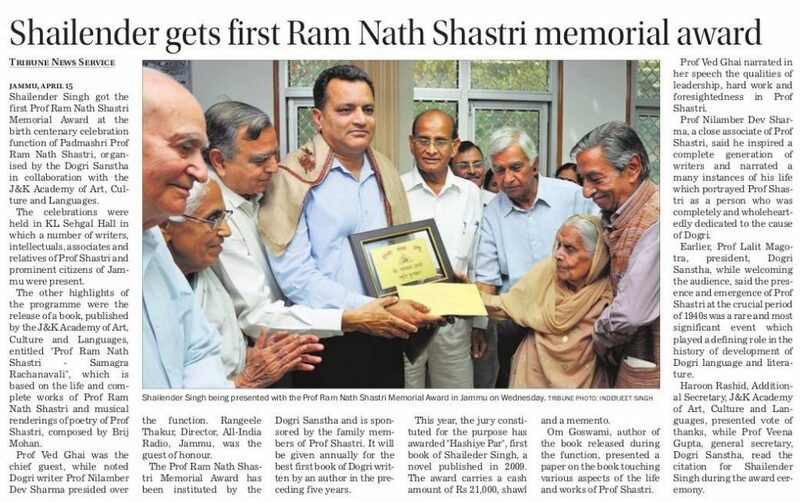 The awarded was presented during birth centenary celebration functionof Padmashri Prof Ram Nath Shastri, organized by Dogri Sanstha,Jammu in collaboration with J&K Academy of Art, Culture and Languages. A galaxy of writers, intellectuals, associates and relatives of ProfShastri and prominent citizens of Jammu were present on theoccasion. The other highlights of the program, included release of a book publishedby J&K Academy of Art, Culture and Languages, entitled “Prof. RamNath Shastri— Samagra Rachanavali’’ which is based on the life andcomplete works of Prof Ram Nath Shastri and musical renderings ofpoetry of Prof Shastri , composed by Brij Mohan. Prof Ved Ghai was the chief guest on the occasion while Prof Nilamber DevSharma presided over the function. Rangeele Thakur, Director, All India Radio,Jammu was the Guest of Honour. 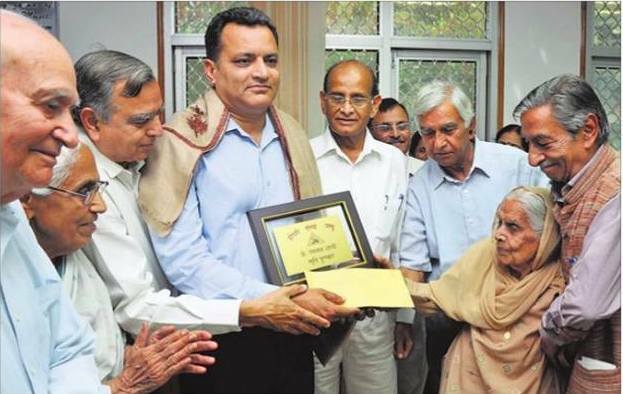 Prof Ram Nath Shastri Memorial Award has been instituted by Dogri Sanstha andis sponsored by the family members of Prof Shastri. It will be given annuallyfor the best first book of Dogri, written by an author in the preceding 5years. This year, the jury constituted for the purpose, has awarded ‘ HashiyePar’ first book of Shailender Singh, a novel published in 2009. The awardcarries a cash amount of Rs 21,000, a shawl and a memento. Dr Om Goswami, author of the book released during the function,presented a paper on the book touching various aspects of the life and works ofProf Shastri. 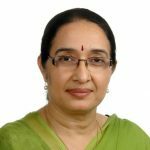 Prof. Lalit Magotra, president of Dogri Sanstha, said that presenceand emergence of Prof Shastri at the crucial period of nineteen fortieswas a rare and most significant event which played a defining role in thehistory of development of Dogri language and literature.